How Are Different Learning Styles of Students Addressed by Online College Professors? One of the most effective ways to truly teach students new information is to understand their own personal style of learning. Every human brain operates in a slightly different manner, and this means that data will be absorbed more effectively with a personalized plan of attack. Unfortunately, not every student has the chance to take traditional classes when it comes to their higher education and more individuals than ever are opting for affordable online schools. For those that would like to understand the nuances associated with the various styles of learning, here is a closer look at how some online professors have tackled these issues. 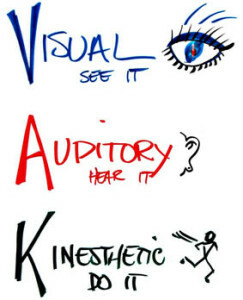 According to most specialists, there are three primary styles of learning: auditory learning, visual learning, and kinesthetic learning. Many people will move beyond these three basic categories and benefit from social learning, solitary learning, or even mathematical and logical learning. Auditory learners quickly absorb information when they are able to listen to it, including reciting things out loud. Visual learners, on the other hand, can focus on spatial learning and must see data one or more times before the information will fully sink in. Finally, kinesthetic learners are often referred to as “hands-on” and are more effective students when they can feel objects or even write information themselves. How Important is One’s Learning Style? Many students will go through their entire academic career without fully tapping into their own learning style. While reports published by the Huffington Post show that researchers do not have a complete understanding of these learning styles, they can be beneficial. Another important piece of information to note is that many students are notoriously ill-advised about their own style of learning and may not have the prescience to understand what will work best for them. Through the use of online courses, fully tapping into a student’s academic prowess can become that much more difficult without face-to-face interaction. Luckily, many of the top online professors do have a number of tools at their disposal in order to appeal to each type of student. Some of the most popular choices now include online discussion boards, the use of videos, pre-recorded lectures, and even home kits with any number of useful objects for learning. Kinesthetic learners will often feel as if online courses may not suit their own needs, but this has also changed in recent years. Online “field trips” allow students to not only see information, but to manipulate graphs, maps, equations, and a number of other tools in order to make the most out of their education. Countless hours of research has gone into learning styles and how they affect students, and this information is now being adopted by a number of online schools. No matter a student’s style of learning, online classes can still provide the engaging environment that they need to excel in their studies.